The speakers were David Ben-Zvi (Austin), Manjul Bhargava (Princeton), Bill Minicozzi (MIT), and János Kollár (Princeton). 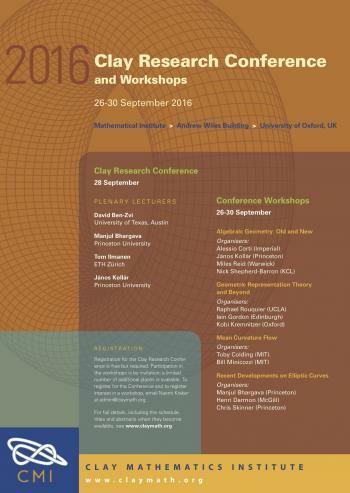 Thomas Clay presented the 2016 Clay Research Awards to Mark Gross and Bernd Siebert in recognition of their groundbreaking contributions to the understanding of mirror symmetry, and to Geordie Williamson in recognition of his groundbreaking work in representation theory and related fields. Alessio Corti spoke about the work of Gross and Siebert and Raphael Rouquier spoke about the work of Geordie Williamson.